Last Updated: 11/22/2012 | File Size: 4716 KB | Price: $39.95 | Downloads: 118 | Developer: DVDSmith Inc.
Any DVD Cloner for Mac is the best DVD movie copier, DVD backup software to decrypt and copy DVD movie to DVD or local drive with 1:1 ratio at super high DVD copy speed, compress DVD9 to DVD5 with great quality, copy DVD to DVD backup folder. It is the best choice to make backup copies from any non-protected and copy-protected movie DVDs. 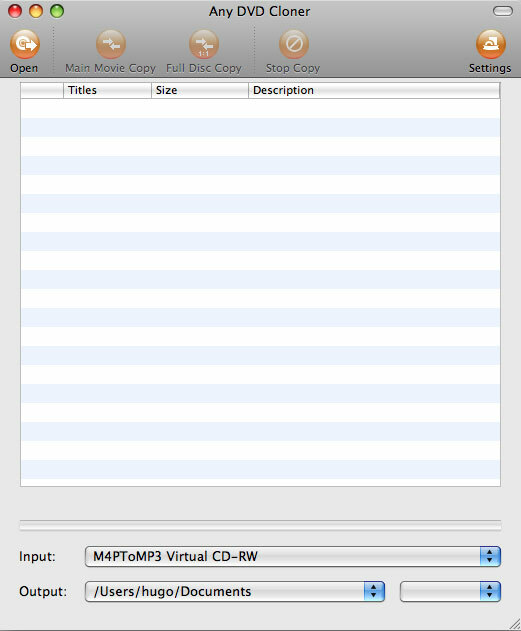 With Any DVD Cloner for Mac, you can easily back up any movie DVD to DVD+R/RW, DVD-R/RW disc, make clones of your favorite DVD movies on DVD with just a few clicks. These working copies allow you to play on home and computer DVD players every day without the inevitable risk of getting your originals scratched or damaged. Statement: First, please download the orginal installation package by clicking the download link. Of course you may also download it from the publisher's website. Using Any DVD Cloner for Mac crack, key, patch, serial number, registration code, keygen is illegal. The download file hosted at publisher website. We do not provide any download link points to Rapidshare, Hotfile, Depositfiles, Mediafire, Filefactory, etc. or obtained from file sharing programs such as Limewire, Kazaa, Imesh, Ares, BearShare, BitTorrent, WinMX etc. Software piracy is theft. If you like Any DVD Cloner for Mac please buy it.